&quoPhew! what a weekend. been great getting this race together and we hope you guys get the share of fun too! here’s what’s important, and for the rest do enjoy the photos and videos. Race Results Media Coverage congratulations to our pan pacific city chase quiz winner, Sean Lee Chun Meng! HM’s took the hot seat again as Director Sportiff for Team SACA in Anti Drug Tour of Thailand, a 4-day stage race in Kanchanaburi and Rachaburi province of Thailand. Our DirT crew insists he shares his spring time break away from the mud. 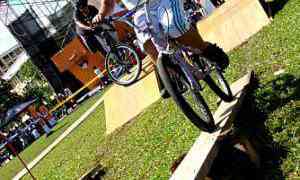 The next MTB race in Singapore will be at Kent Ridge again. mark 18 March 2007Â down as the date with us more details can be obtained from DirTraction website. The new Tampines MTB extension survived the a full day of racing. SACA XC DirtzBash turn out to be as muddy as needed, giving everyone a whole load of fun. The trail will be up for surfacing and modifications, stay tune for a dryer ride.